Acute flaccid myelitis (AFM) is a very rare condition that affects a person’s spinal cord marked by the sudden onset of weakness in the arms or legs. 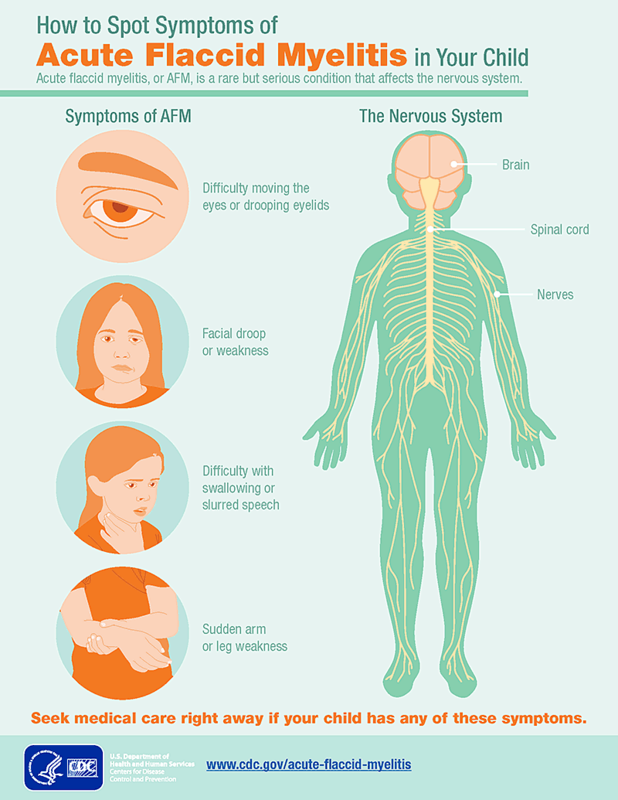 AFM can be difficult to diagnose because it shares symptoms with several other neurologic conditions. All suspected cases of AFM are reviewed by the CDC to determine if they meet the case definition. It can take about a month for the status of a case to be determined. CDC data shows a pattern of increased AFM cases in late summer to early fall of every other year beginning in August 2014. Texas providers have reported 46 cases of AFM since 2014. Most of the cases occur in children. Less than one in a million people in the United States will get AFM each year. There is no specific treatment for AFM, and in most cases the cause is unknown. Because the cause of most of the AFM cases is unknown, the Centers for Disease Control and Prevention is conducting an investigation to determine possible causes and risk factors for the condition. Possible causes include infections, environmental toxins and genetic disorders. AFM is not required to be reported, but DSHS is asking all healthcare providers to report suspected cases of AFMto their local health departments.